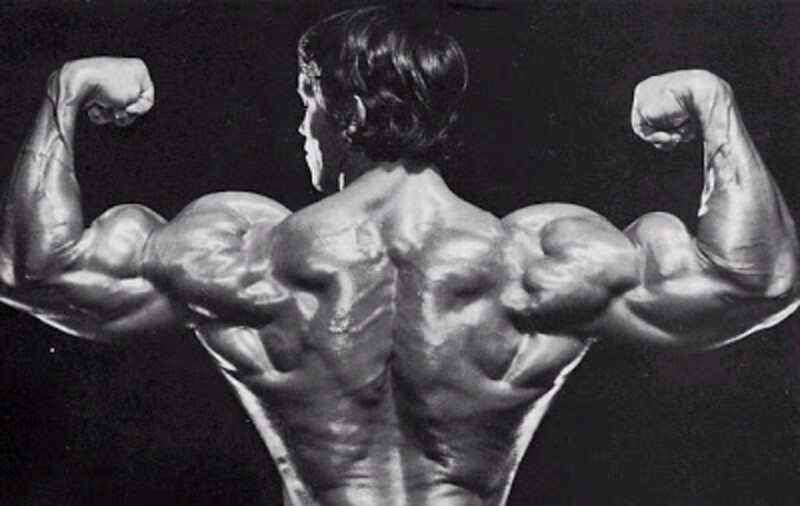 Sore or Stiff Between the Shoulder Blades? Are your shoulders sore from exercise or sitting hunched over your computer day in and day out? 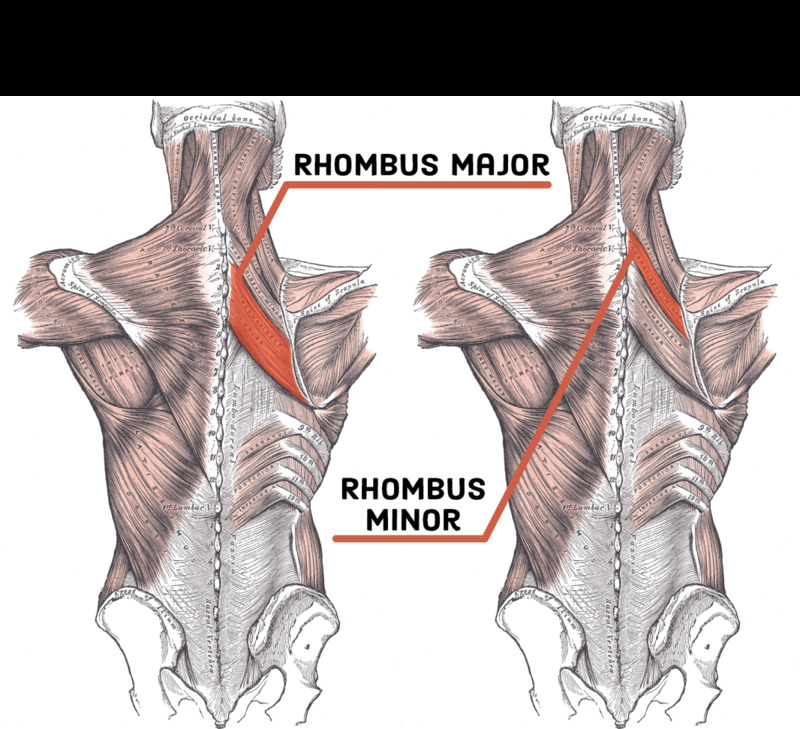 If so, what you're actually feeling are the rhomboid major and minor muscles, which enable the shoulder blade to move. These muscles attach shoulder blades to the thoracic wall. The purpose of these muscles is to stabilize the shoulder blades, pulling them downward and together. These small muscles also help maintain proper posture and keep the shoulders from dropping forward. As a result of constant use, these muscles can easily become sore and tense, especially if you sit in a hunched or slouched position all day behind a desk. Either facing or standing perpendicular to the wall, walk your fingers up the wall. Grasp a secure, waist-level object and step back until your body is perpendicular to your legs. 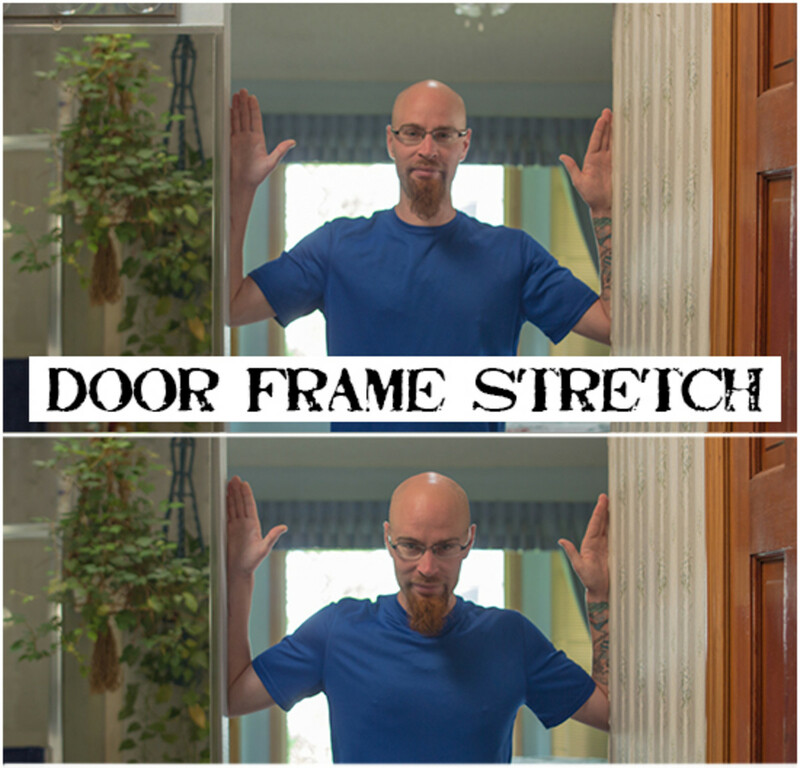 Place forearms vertically on the door frame and lean forward. Clasp hands behind your back and lift arms. Reach up with both arms and grab one elbow with the opposite hand. Pull elbow over and downward. Repeat with other elbow. See detailed instructions and photos below. In addition to postural causes, sore shoulders and painful shoulder blades can also be caused by a variety of conditions. A strain from physical activity, tendonitis from overuse, a pinched nerve, or shoulder-joint instability may also be the cause. 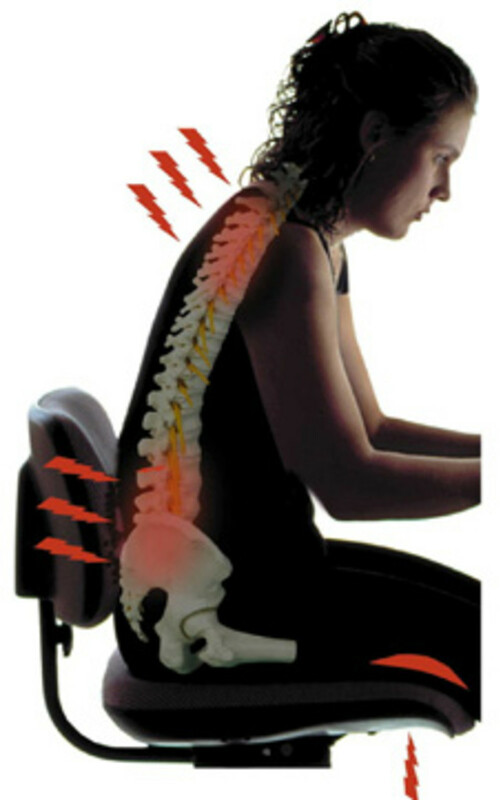 In the majority of cases, the pain is caused simply by posture or overexertion. Occasionally, more serious conditions can also cause this type of pain. If you are experiencing more severe pains in this area, then it can also be indicative of a heart attack or gallstones. Consequently, you must see a doctor or other health professional to get checked out properly. It is highly likely that it is nothing serious, but it's better to be safe than sorry! You should also see a doctor if you have a shoulder injury accompanied by severe pain, sudden swelling, or the inability to raise your arm above your shoulder. If your rhomboid muscles have become sore and tense because of a lot of exertion or bad posture, you should try the following shoulder blade stretches to help alleviate your aches and pains. For the wall stretch, walk your fingers up the wall. 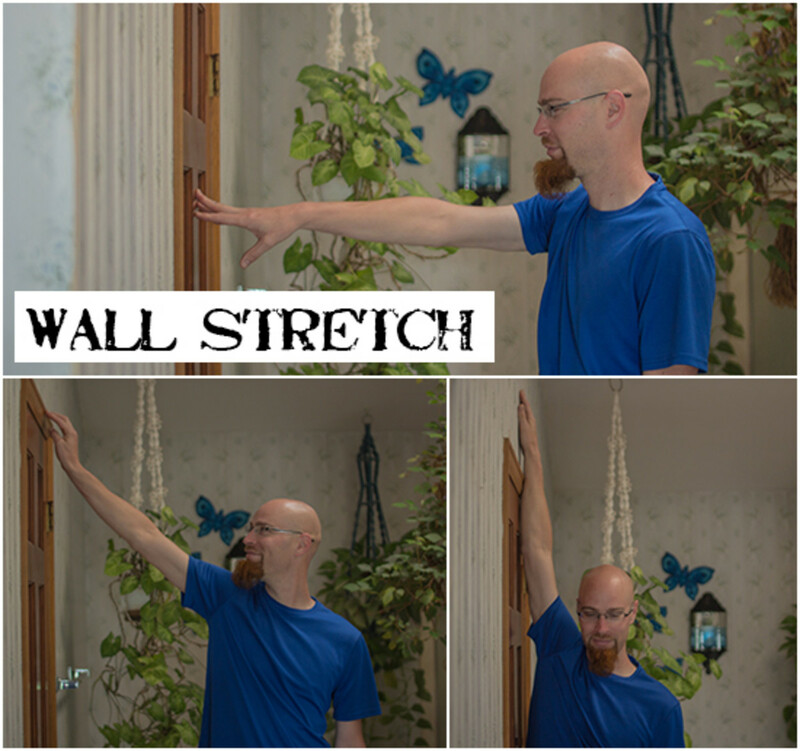 You can do this stretch both with your body facing the wall and with your body perpendicular to the wall. The name for this stretch is a bit of a give away. 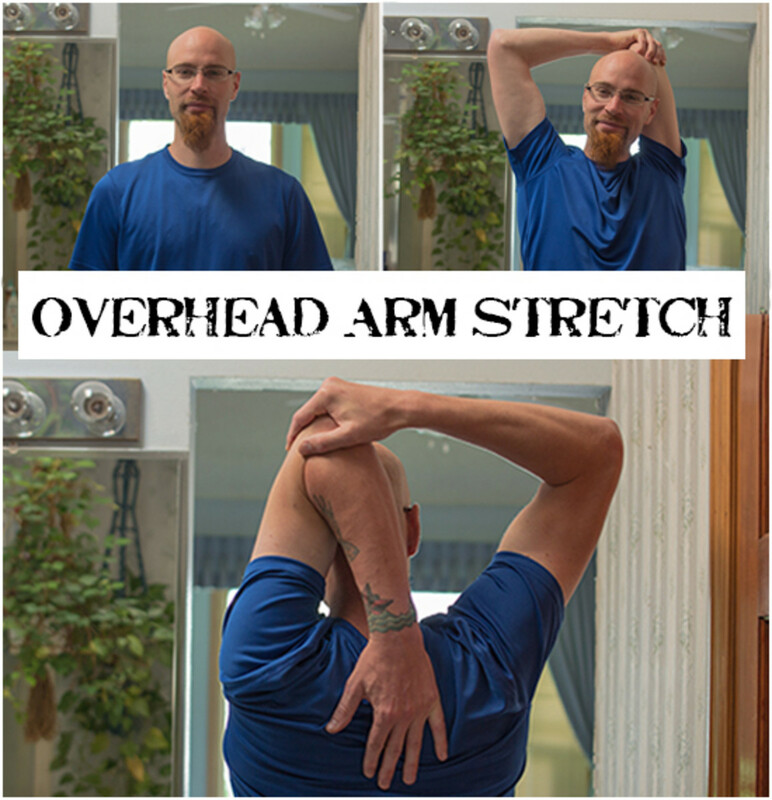 It's a very easy, but effective, stretch to complete and will help loosen your muscles. 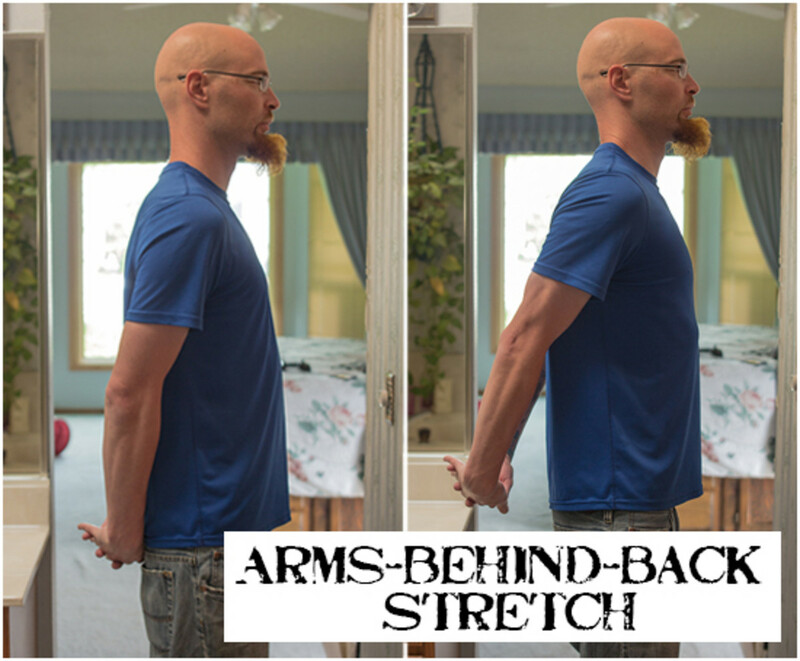 You can do this first stretch one arm at a time or with both arms simultaneously. Face a flat wall in a standing position, while making sure that you are far enough from the wall so only your fingers come into contact with it. Now let your fingers climb up the wall while walking towards it slowly. Ultimately, this will raise your hands and stretch your fingers as far up as possible while you will be standing as close as you can to the wall. For the door handle stretch, grasp a secured waist-level object and step back until your body is bent perpendicular from your legs, with your arms reached before you. 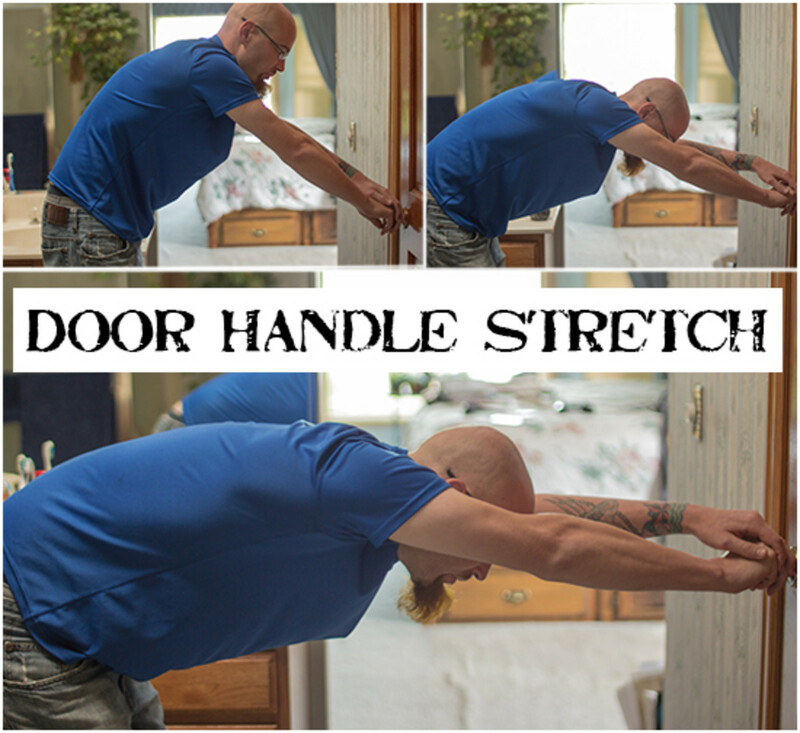 Again, this is a really easy shoulder blade stretch that you can do with a chair, door handle, or towel rail. Grab hold of your chosen object with both hands while standing in front of it. Now lean toward the object but do not move your arms, and step backwards slowly while maintaining a firm grip on the object. This will ultimately bend your torso at a 90 degree angle and will extend your arms completely. If you chose to use a door handle (and the door is closed) then this can be useful as you can apply a bit more stretch to your shoulders than you could with a moveable object. This particular stretch concentrates on each side of the shoulder one at a time. This means you will have to complete this stretch on one side first, then repeat it on the other side. This way you will be able to equally stretch both sides. Stand in an open doorway and raise your arm at 90 degree angles out from your sides. Position your arms like goal posts, with your forearms pointing upwards at a 90-degree angle from your upper arm. 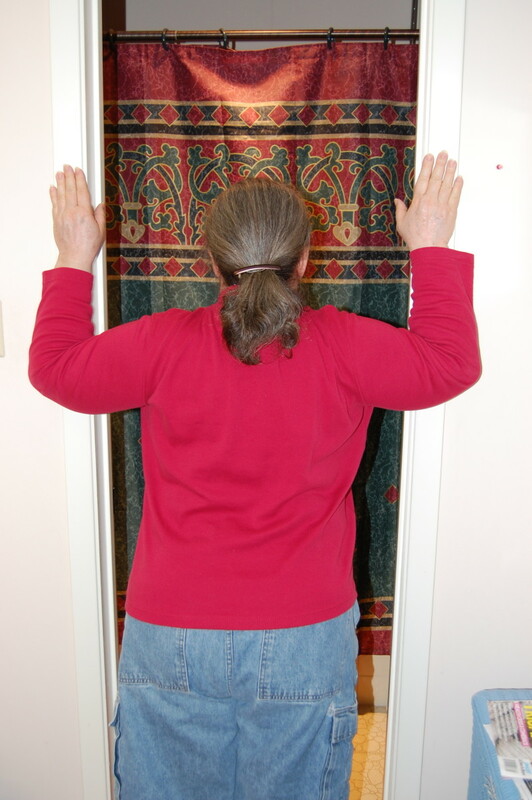 The vertical part of your arm should be placed against the door-frame. Lean forward and take really gentle half steps. This stretch can be beneficial not only for curing pain between your shoulder blades but also for stretching out your chest and upper back. For the arms-behind-back stretch, clasp your hands behind you and lift your arms. Keep your back straight and extend both your hands behind your body while keeping them clasped together. Gently lift your hands toward the ceiling and maintain this position for at least 20 seconds as you stretch your shoulder blades to the max. Return to the initial position gently and repeat until you feel relief in your shoulder blades. For the overhead arm stretch, reach both arms up and grab one elbow with your other hand. Pull the elbow over and downward. This is probably one of my favorite shoulder stretches as it is one of the best quick fixes to relieve tension in your shoulders and get rid of some of that stiffness. Basically you take each arm one at a time and raise it above your head. Then bend the arm at the elbow so that your hand and forearm go behind your head and touch your opposite shoulder. The more you can push your elbow in and slide your hand down your upper back, the more you will feel this stretch. 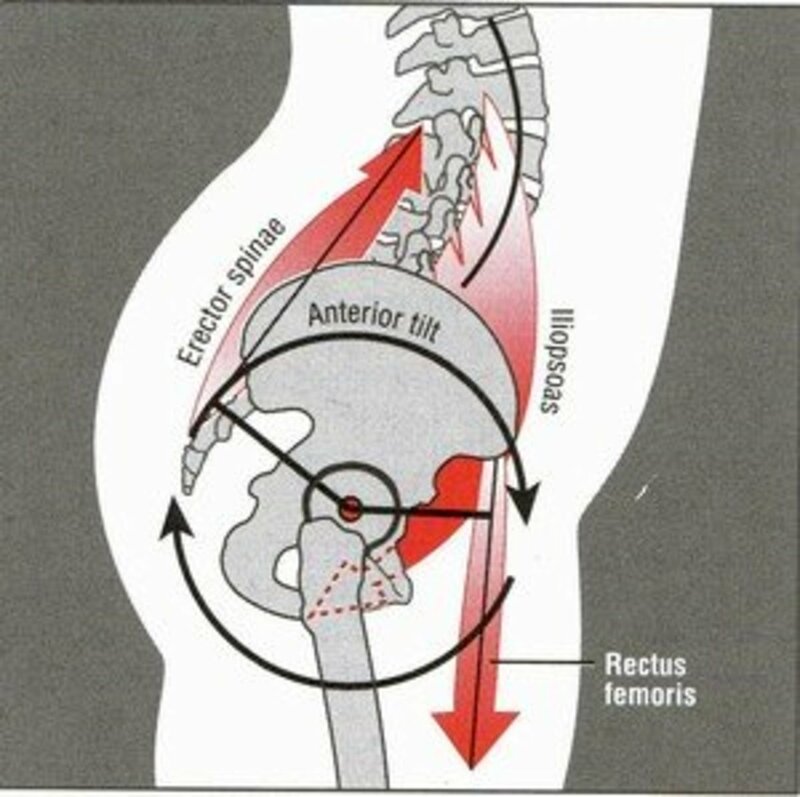 The main benefits of this exercise is to stretch the posterior deltoid muscle, together with the triceps. Once you have done this for one side, make sure you also stretch the other side to ensure they are stretched evenly. Anti-inflammatory medication or a pain reliever. Advil, Aleve, and Tylenol can help reduce the pain. Ice. Wrap an ice pack or frozen peas in a dish cloth and apply it to the pain. This is especially helpful for pain caused by recent overexertion. Heat pad, warm towel, or hot water bottle. Applying heat to sore muscles can help relieve the pain. Be careful, especially with the hot water bottle, that the heat source is not too hot for your skin. If it is too hot, you can wrap it in a dish cloth so that it does not touch your skin directly. If you ever feel like your shoulder blades and muscles feel sore or tensed, you can perform any of the above shoulder blade stretches to provide quick relief. For long-term relief, you will want to look at what the causal factors are of your aches and pains, whether it be bad posture or over-use. In the case of bad posture, you can look at getting a more ergonomic chair, keyboard, and desk (see these tips). Taking breaks regularly is also important, as is undertaking a regime of strengthening exercises in addition to your stretches. These will help you build up muscular strength and stability, which will minimise the soreness that develops in your shoulders. Of course, if you have a high level of pain, it may indicate something more serious, so don't ignore your body. If you are in pain, you should see a medical practitioner. Thanks for reading. I hope this article has given you a few useful ideas to help alleviate your shoulder pain. I recently hurt my right shoulder blade while swimming. This article has been so helpful, thanks alot for posting. Thank you I do sit at computer, but this started working in a heavy caring environment . It worked a treat. I realise how stiff and inflexible my dominant shoulder has become. No wonder my Rhomboids are struggling. thank you for the stretches! this really helped really fast too! I've been working out and it's more of knot I can't untangle lol. Really annoying and makes me fidgety. I believe now that's it's due to lack or stretch cool down. Thanks for the comment Lisa, glad you found it useful! Yep sitting at the computer is a nightmare for trying to stay fit and healthy! Great advice for those of us who spend all day on the computer!